The glamorous pullover is worked in Plymouth Yarn`s Furlauro with a stripe pattern on the lower edges of the sleeves and body. To fit Misses’ sizes Small (Medium, Large, X-Large). Directions are for smallest size with larger sizes in paren­theses. If only one figure is given, it applies to all sizes. Finished Bust: 33 (38, 43 1/2, 48) in. Back Length: 22 (23/2, 251/2, 26) in. Crochet hook size G/6 U.S.
3 1/2 sts = 1 in. with Plymouth Yarn’s FURLAURO and 24K on larger ndls in Stripe Pat. NOTE: FURLAURO is worked with a sin­gle strand of yarn; 24K is worked with a double strand of yarn. sc = single crochet: Insert hook in next stitch, yarn over, draw yarn through stitch, yarn over, draw yarn through 2 loops (= 1 sc). 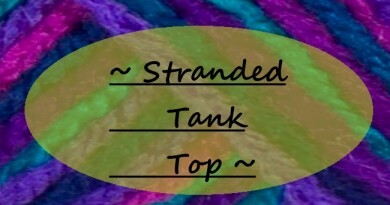 Stripe Pattern: With 24K held double and larger ndls, p 1 row (WS), then beg with a RSR work 4 rows in rev St st.
With FURLAURO and larger ndls, beg with a RSR work 7 rows in St st.
Rep these 12 rows for Stripe Pat. BACK: With smaller ndls and FURLAU­RO, CO 60 (68, 76, 84) sts. Work 4 rows garter st. Change to larger ndls. Work 7 rows St st. Work in Stripe Pat until there are 5 stripes of 24K. Cont in St st with FURLAURO only until piece meas 16 1/2 (16 3/4, 17 1/2, 17 1/4) in., ending with a WSR. 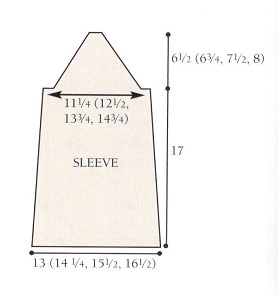 Shape armholes: BO 2 sts at beg of next 4 (6, 8, 8) rows. Dec 1 st at each end EOR 4 (4, 4, 6) times – 44 (48, 52, 56) sts. Work even until piece meas 22 (23/4, 25, 25/2) in. from beg, ending with a WSR. 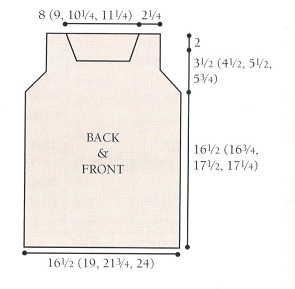 Shape shoulders: BO 4 sts at beg of next 4 rows. SI rem 28 (32, 36, 40) sts on a holder. FRONT: Work as for Back until piece meas 20 (21 /4, 23, 23/2) in. from beg, ending with a WSR. Shape neck: Next row (RS): K 11 sts, join another ball of FURLAURO and BO center 22 (26, 30, 34) sts, k rem 11 sts. Working both sides at the same time with separate balls of yarn, dec 1 st at each neck edge EOR 3 times. Work even until piece meas same as Back to shoulder. Shape shoulders: BO rem 8 sts each shoulder. 48, 52) sts. Cont even in St st with FURLAU­RO only until piece meas 17 in. from beg, ending with a WSR. 11,13) times. BO 2 sts at beg of next 2 rows, then 3 sts at beg of next 2 rows. HOOD: Join shoulder seams. With RS fac­ing, using circular ndl and FURLAURO, beg 5 sts to the left of center along Front neck BO edge, PU 7 sts across left side of BO edge, PU 15 sts up right Front shaped neck edge to shoul­der, work across 28 (32, 36, 40) sts from Back neck holder inc 4 (4, 6, 6) sts evenly spaced across these sts, PU 15 sts down left Front shaped neck edge and 7 sts across right side of BO Front sts – 76 (80, 86, 90) sts. Note: There are 10 sts across the Front that are not picked up. Working back and forth on circular ndl in St st and keeping first 5 and last 5 sts of each row in garter st, work in rev St st for 14 in. BO all sts loosely. Fold hood in half and sew top seam. FINISHING: Sew Sleeves in place. Join side and Sleeve seams. 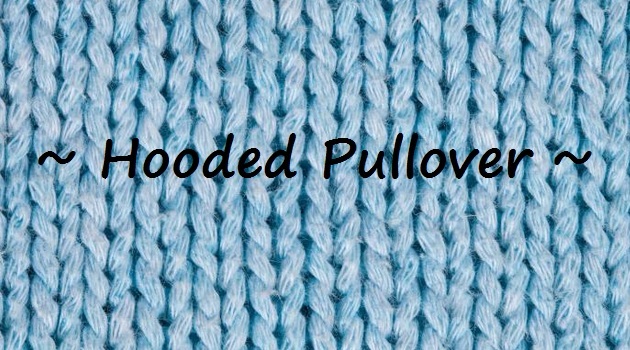 Crocheted chain: With crochet hook and 24K held double, make a chain long enough to go from one side edge of hood over the top to other edge of hood. Turn, chain 1. Work sc, grabbing 1 knitted st along with each chain st across. Chain 1, turn. Sc through back loops only across row, ending with a chain st. Cut yarn, pull through and anchor. Weave in all ends.